Over the years, I have met so many fierce people who have courageously won their battle against cancer. Their stories of perseverance and survival are both moving and inspiring. Cancer is a word no one wants to hear. It's a word that immediately brings on fear, worry and anxiety. Regardless how much support you have from your friends and family, unless they have survived cancer themselves, there is a sense of helplessness mixed with loneliness. I recently read about an amazing program that recruits and trains cancer survivors to act as peer navigators, or "cancer coaches," to newly diagnosed cancer patients. The WeCARE! Community-Based Cancer Peer Navigator program was designed by Marlene von Friederichs-Fitzwater, MS, Ph.D., MPH, who survived both cervical and colon cancer. 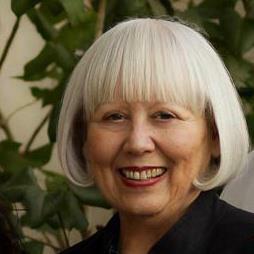 She is the Director of Outreach Research and Education Program, UC Davis Comprehensive Cancer Center. Marlene stops by to share more about this amazing program and how you too can make a difference as a peer navigator. JB: You have an amazing story. You not only beat cancer once, but twice. For our readers who are either beginning their fight with cancer or supporting someone that is going through cancer, what words of wisdom can you share about the journey? MF: Even if you are a cancer survivor, you can't know what the experience is like for someone else. Each person responds differently to the diagnosis, but after almost 10 years of working with cancer patients and survivors, I have learned that some things lead to a better outcome. First, it helps to have a positive attitude toward the experience. Having a cancer survivor who has traveled a similar path to talk with when you are diagnosed provides hope and inspiration. It is a very anxious and fearful time and most newly diagnosed patients try to be brave and not share their anxiety and fear with family members and friends. It takes a lot of energy to "put on a happy face" for others when you are so afraid. Secondly, arm yourself with accurate and current information on your disease and the treatment options so you can partner with your doctor to make shared treatment decisions. JB: I can't even imagine what it's like to hear the words... You have cancer. You heard those words twice. What were those first days like? MF: I felt extremely frightened and anxious. I was a single mother of four sons with one teenager still at home and the sole supporter of my family at the time I was first diagnosed with cervical cancer. While I was scared about surviving, I was actually more concerned about my sons and the financial issues - could I keep working through treatment? Would I be able to pay my co-pays and other expenses? Who would keep an eye on my teenage son? There were periods of time I was so stressed, I would just shut down. JB: How important was having a great support system during your journey? MF: The majority of my friends and family were not able to provide support because they were scared and didn't know what to say or how to act, so they just avoided me. Back then, there weren't many services or much support for cancer patients. Cancer as a disease was a stigma. It was then that I made a promise - if I survived, I wanted to do something to make the experience easier and better for cancer patients. When I was appointed to a faculty position in a major school of medicine, I was also asked to develop and direct an outreach research and education program for an NCI-designated comprehensive cancer center. Shortly after that, I developed the WeCARE! Community-Based Cancer Peer Navigator program. The program is free and available to anyone in the greater Sacramento region in Northern California who is diagnosed with cancer. We are launching a new WeCARE! Cancer Peer Telenavigator program for remote rural areas in Northern California in 2015. This one-on-one service with a trained cancer survivor provided throughout active treatment has proven to be invaluable. JB: How does the program work? MF: The WeCARE! program recruits and trains cancer survivors who have been out of treatment for at least two years and then carefully matches them with newly diagnosed cancer patients who want a "cancer coach." The peer navigator works one-on-one with the patient, providing disease and treatment information, and helping prepare the patient for the first visit with an oncologist, radiologist or surgeon. The cancer coach can go to the doctor or treatment with the patient. Peer navigators can also provide patients with resources and other services as needed. We gather baseline, 30-, 60- and 90-day data from patients on anxiety levels, knowledge of their disease and treatment options, confidence in communicating with their doctors as well as problem-solving and coping skills. Peer navigators are trained in a cognitive/behavioral model to improve problem-solving and coping skills to empower patients and give them some control over their cancer journey. JB: What kind of feedback have you received from your patients that have partnered with a cancer coach? MF: We receive feedback continuously from the patients assigned to peer navigators and we also know from the analyses of the data we collect from the patients that the WeCARE! program is making a significant difference in their cancer experience. We have had statistically significant outcome data for over five years that tells us peer navigators reduce patient anxiety, increase disease and treatment knowledge, improve confidence in communicating with doctors and improve patient problem-solving and coping skills. Interestingly, our peer navigators also tell us how much they have gained from being peer navigators. Comments include, "Being a peer navigator helped me understand the value of giving back and helping someone else who is dealing with cancer." and "My quality of life greatly improved once I become a peer navigator." JB: For our readers who would like to volunteer as a cancer peer navigator or would like the support of one, where can they learn more about the program? MF: Anyone interested can contact me at marlene.vonfriederichs-fitzwater@ucdmc.ucdavis.edu for more information.